Browse through our curated list of the best barware and drinking gift ideas for your man, including the most wished for beer, cocktail, wine accessories and glassware that fit any budget. #1. A custom made Beer Cap Map of USA which holds 81 of his favourite beer caps is the perfect gift for the beer drinker. The map is laser cut and is ideal to save all of the beer caps that remind him of great times. Simply popping the caps into the slots and hang it on the wall for the perfect and unique display. More awesome is that it can be personalized using letters and special character and emojis. #2. The Man The Myth The Legend Custom Beer Mug is the perfect gift for the man who have never lost a beer pong. These durable mug crafted from sturdy glass with a heavy base for a quality feel can be personalized with his name or title of your choice. #3. Failte (welcome) to the Irish Pub! Failte Irish Pub Personalized Wooden Sign features a pub glass with a lucky shamrock in the centre, making it a great addition to your man’s bar decor. Made of birch wood and printed with your own custom text in full, vibrant colour, these custom signs will last for years to come. Go for a larger size, used the pre-drilled holes and surprise him big time. #1. A Pro Shaker 10 Piece Bar Set is great to get started making drinks and having fun in no time. This metropolitan 10-piece 8/18 stainless steel bar set includes a bottle/can opener, ice tongs, two tone pro shaker with 5 cocktail recipes and slip free grip, ice strainer, 10″ stir spoon, double sided measuring jigger, bar knife with curved lifting fork end, ABS plastic 8 1/2″ x 5 1/2″ cutting board, and a handy caddy with rubber feet for easy carrying and storing the tools when not in use. #2. A Deluxe Hammered Steel 9pc Bar Tool Set will stock his bar with some great quality bar tools. This set is featuring a handsome hammered stainless steel and includes everything he’ll need to get started making mixed drinks. Set includes a 26oz cocktail shaker, strainer, stir spoon, bottle opener, fruit knife, double jigger, 14-inch serving tray, and an ice bucket. #3. Don’t you know, all men, including yours, grow up wanting to be a secret agent? Your mission if you choose to accept it…is to have an exclusive invite-only cocktail party. Get him the DOPP Kit Leather Travel Bar Set he will travel like 007 with this bar set in disguise! The luxurious DOPP Kit Leather Travel Bar Set is really a portable bar set which is discreet enough that no one will know it’s true purpose! The case measures 13.5″ x 6.5″ x 5.5″ – which fits perfectly in most suitcases – has an olive green ultra-suede exterior with rich brown Italian leather sides, handles, and accents, and a brown ultra-suede interior. 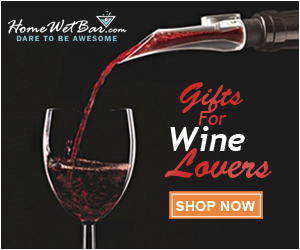 It features plenty of room for a standard 750ml liquor or wine bottle, a stainless steel wine corkscrew, ice tongs, stirring stick, and four collapsible stainless steel cocktail glasses which are 2.75″ tall and hold an ample 5oz each. A great gift for your lovely man who enjoys the finer things in life. #1. A Port Sippers, Set of 4 is a charming way to serve desert wines and liquors. These port sippers originally date back to the 17th-century Europe, where they were known as Schnapps Pfeiffen. Handmade of lead-free crystal these sippers comes in a lovely gift box. #2. Owls are a symbol of wisdom, so be smart, and check out this Drunken Owl Wine Bottle Holder. This hand painted wine holder is made from sturdy poly resin, and moulded in the shape of a realistic owl. When this thirsty owl holds one 750ml wine bottle in its wings, he appears to be guzzling as fast as he can. Capable of displaying almost any standard size liquor bottle, this owl wine bottle holder is perfect for adding an outdoorsy feel to any room. This wine holder will fit right in on any tabletop or bar. #3. These Oakmont Personalized Marble Wine Chiller adds a special touch to a birthday or anniversary dinner table. Made of heavy black marble it will keep your wine bottle chilled all through dinner. Customize it with your man’s name and transform it into a functional yet sophisticated gift.